This fold N' go outdoor hat comes in your choice of khaki or navy and is ready for all of your outdoor adventures. This nylon hat is wide brimmed, water resistant and blocks UV rays for ultimate protection. 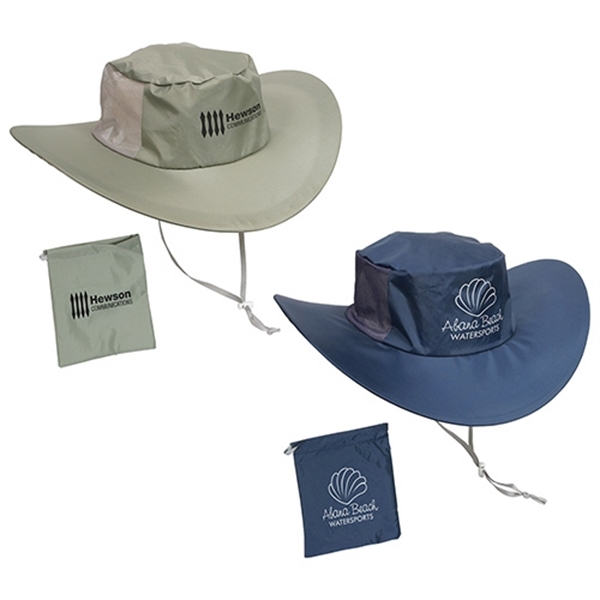 Twist to unfold from a compact 5" disc to a 15" hat and adjust the drawstring for a western or leisure style. Great for men and women, this hat offers a mesh back panel, a chinstrap and a convenient carrying bag. Customize for your next event. Size: 15 " x 15 " x 3.25 "
Ship Weight:19 lbs, Shipping is UPS, FedEx, or truck line by request. USPS is available for APO addresses only.